U.S. Mail Supply offers a variety of outdoor pedestal style mailbox units for sale. Vital F-Series Cluster mailboxes are USPS approved and come in a variety of sizes and configurations. Our pedestal mailboxes are built to withstand adverse weather conditions. They’re durable and available in a wide variety of configurations and styles from decorative to standard. With powder-coated aluminum build, no rain is going to rust these mailboxes anytime soon. Your mail will stay high and dry with pedestal mailboxes from US Mail Supply. View all available mailboxes for sale online from U.S. Mail Supply. Everything you need is included with your new cluster box unit from U.S. Mail Supply except for two things. We do not include the USPS “Arrow” Locks for security reasons. The USPS does not allow the factory or any non-USPS personnel to possess the master locks (also known as “Arrow Locks”), which are installed in the outgoing mailbox door, as well as each of the parcel locker doors. The local USPS will install this lock on these doors upon your request to do so. We also do not include Anchor Bolts for mounting the unit. The USPS has requested we do not include the anchor bolts for mounting the unit to concrete due to varying frost lines throughout the United States. The factory recommends ½ inch diameter J-Bolts, with the length to be determined by the thickness of the concrete pad (pad depth commonly 5-6 inches). You will need four anchor bolts per unit, and they can be picked up at any local hardware store. Please refer to the installation instructions that are shipped with the mailbox. Shop commercial traditional and classic style outdoor pedestal mailboxes for sale from U.S. Mail Supply - mailboxes for apartments, condos, town houses or any multi-family residences. Buy residential outdoor pedestal mailboxes (box and post combos) for homes or other single unit / single family residential buildings. Please be sure to read up on the details for intended use. We've got a deep supply of apartment mailboxes available for sale online. If you're considering indoor options or breaking down mail boxes into single units, check out our full inventory. 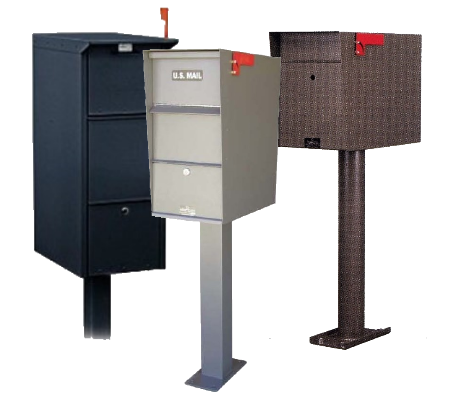 Shop large and small locking outdoor commercial and pedestal metal mailboxes for houses and apartments available for sale from U.S. Mail Supply. Free-standing post mounted outdoor mail boxes are best for multi-unit structures and buildings. 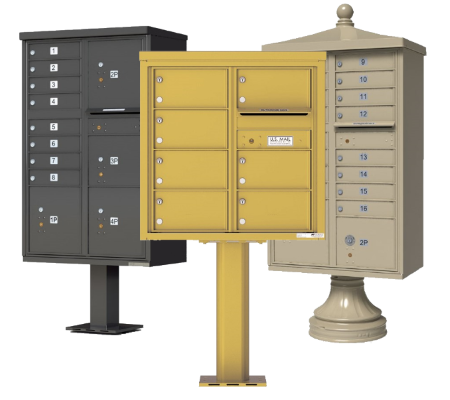 Secure locking pedestal mailboxes come in may styles and sizes – from decorative style free-standing mailboxes to classic style commercial mail boxes. Buy USPS approved commercial outdoor mail box clusters for apartments, offices, companies and businesses throughout the US. Cluster mailboxes provide a convenient, central location for apartment tenants, hotel guests, even military base residents to pick up their mail. Whether you are an apartment manager seeking a decorative cluster box unit for your property or a small business owner looking for a private use letter locker mailbox, U.S. Mail Supply has a great selection of cluster mailboxes mounted on pedestals. Constructed of powder-coated stainless steel and aluminum, the cluster box units are weatherproof and resist rust, scratches, and vandalism. The doors of our Vital F-Series cluster box units, for instance, are designed to prevent prying and provide maximum security against theft. Apartment buildings and other multi-tenant housing facilities need secure mailboxes for their residents’ mail and personal information. Our durable outdoor pedestal style mailboxes are USPS approved and come in a range of sizes and configurations. Our decorative outdoor mailboxes and accessories, including a pillar pedestal cover and crown molding roof cap, add a stylish touch to any apartment complex or multi-resident living facility. Private use 4C pedestal mailboxes and private use delivery and collection units, for internal mail only, are ideal for dormitories, military bases and hotels. Our high-security cluster mailboxes exceed USPS safety standards for residences and businesses that require extra mail security. Our outdoor pedestal mailboxes come in a variety of shapes and styles to meet your needs. Their durability and superior security provide safety and peace of mind. Your bills, packages, and other mail containing personal information will be protected from theft, vandalism, and weather damage. Sturdy construction ensures these outdoor mailboxes will last for many years without rusting or getting scratched, preventing the need for costly repair, repainting, or replacement. U.S. Mail Supply’s outdoor mailboxes are ideal for applications on a variety of properties. They're secure, easy to install and provide convenient access for tenants and postal workers. College housing: While indoor horizontal mailboxes are the best option for large college dormitories, outdoor mailboxes are ideal for housing units where there is no common mailing area. By installing units in a secure outdoor common area, students still have safe access to their mail. Cluster mailboxes also reduce strain on university mailing services, cutting down on the number of items being sorted and making delivery easy. Plus, their high strength construction resists scratches and vandalism. Apartments: If you own or manager an apartment building, safety, convenience and cost are all considerations. US Mail Supply has USPS approved apartment cluster mailboxes to meet your needs. 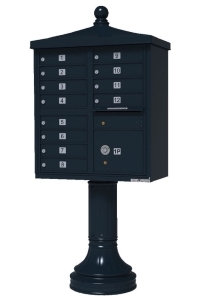 Perfect for multi-building apartment complexes, outdoor pedestal apartment mailboxes provide tenants with a centralized, secure location for their mail. Our modules also free up space when building new developments or redesigning lobbies. Available in a variety of sizes, high security cluster mailboxes protect tenant packages indoors. 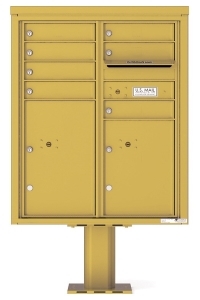 Shop apartment mailboxes available for sale from U.S. Mail Supply. Military bases: High-security cluster mailboxes from U.S. Mail Supply provide military bases with a convenient mail distribution system. Easily accessed by mail carriers and residents, our outdoor mailbox solutions are also perfect for neighborhoods with duplexes, apartment style living, and centralized office buildings or facilities. We also have cell phone cabinets for facilities with small item storage needs. Business parks and complexes: If you are a commercial property owner looking for a high-quality indoor cluster mailbox solution, you’re in the right place. Our cluster mailboxes provide tenants with easy, secure access to their packages. For larger commercial properties with multiple buildings and facilities occupied by businesses, our outdoor pedestal mailboxes may be a better option. Designed to resist vandalism, inclement weather, and normal wear and tear, these centralized, multi-tenant mailboxes look great and maximize mail delivery efficiency. Contact U.S. Mail Supply with questions or for help deciding which mailbox style will best suit your needs.